As the cost of technology continues to rise, IT pros are constantly looking for ways to optimize their budgets. 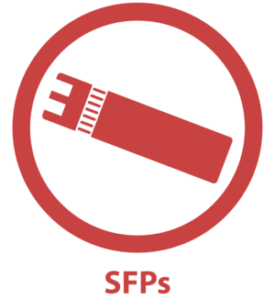 Many have found using compatible SFP’s as a great way to help decrease costs while maintaining reliability. We get our compatible SFP’s from the same place that manufacturers get them, ensuring their quality. They come from the same factories and meet the same quality standards in every shape and form. The only difference between them and the SFP’s you’ve been using is the sticker on the bottom—and the price! Crazy Savings! – SFP’s costs can be a significant portion of your IT project budget. Our Compatible SFP’s can reduce your costs by 50%-70%. Think about that. How many SFP’s a year do you need to buy? I am sure you could find something else to spend that money on. Oh, and how great will you look to the bean counters? Don’t pay for a name on the sticker…It would be CRAZY to pay full price! Lifetime warranty!–Unlike manufacturer warranties, our compatible SFP’s come with a Lifetime Advance Replacement Warranty. Our name and number is on every SFP, so you can rest assured that you can call us day or night should you need a replacement. At Network Craze, we’re as crazy (I mean, as passionate!) about your network as you are. We understand that only you know what’s best for your network, your budget and your business. With that in mind, we deliver quality products that your network, your budget and your business need, not the latest and greatest products that the manufacturers feel you need. By doing so, we allow you to extend the life of your current IT hardware, while at the same time, helping you stretch your budgets, receive fast delivery, benefit from a Lifetime Warranty in most new and pre-owned products and have access to expert sales and support teams. By offering all the top manufacturers in the industry, we are a one-stop-shop for all of your data and voice technology, cabling and storage needs. I had no idea how much money I was spending on SFPs in one year! After talking to my sales rep and doing the math over 12 months, it was a lot of money. By switching to Network Craze brand SFPs, I have been able to take that money saved and put it towards newer technology in my data center.